As the seasons change, each new season brings with it plenty of reasons to get out and enjoy the space you have, no matter how many layers you need to wear to stay warm. The change in the leaves, scenery, and sounds can all bring the perfect opportunity for beautiful Instagram shots, and an environment to clear your head with plenty of fresh air. We’re very fortunate where we live in that we have the Mourne Mountains behind our house (well, Mount Thomas), and the Irish Sea out the front garden. This is just one of the many reasons why we try to spend time in the garden when it’s a clear day. It’s currently the festive season; a great excuse for an chilly BBQ and a reason to get your besties over for an evening of festivities. Therefore, don’t wait until spring and summer to make an effort with your garden; it’s worth putting a bit of time in now, and creating a chic outdoor space you’ll love all year round. However big or small your budget may be; there are an array of things you can to spruce up your backyard and ensure it doesn’t become neglected. Plants also need time to mature so it is important to remember that adding some plants won’t give you an instant show garden but it will add some softness and give you an idea of what your garden could become. We’ve just finished adding a patio area to our garden and this is somewhere we’ll certainly look to enjoy spending many evenings during the spring and summer evenings. As for the coming winter months, well, the addition of some greenery and fairy lights has helped to create a nice ambiance to the garden. With the autumn leaves surrounding many gardens over the past few months, it’s time to get out and give your garden a good clean in time for any festive visitors. Sweep and rake-up any leaves that have fallen and start to get your garden into shape again. 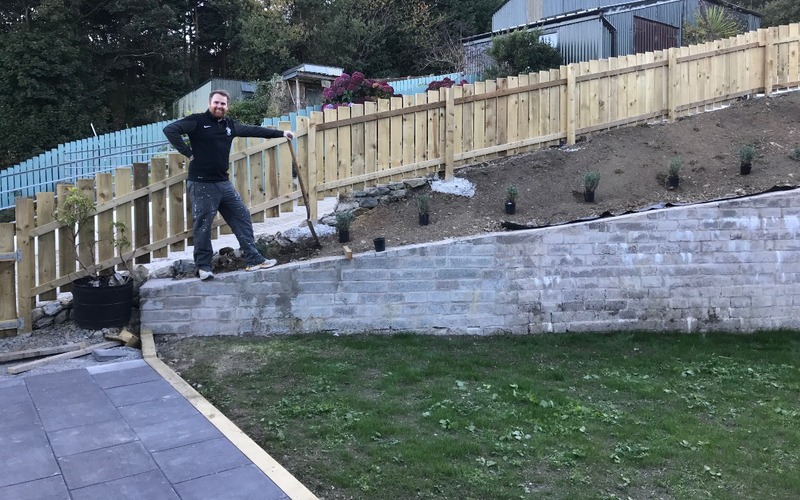 We’ve had to go through several phases of working on our garden through our self-build, with skips and bins common place around the garden as we give it a good tidy. Companies like The Waste Group skip hire can help you tidy away larger bits of debris, with ease, and they’ve a super easy website for ordering from. If you get a dry weekend, you could mow the grass and trim the edges of the lawn. All that garden equipment that’s been lying around, cluttering up your outdoor area will also need a home, so it’s worth investing in garden storage to keep the space neat and fresh. Depending on your budget; you could pop up a tiny shed, that will house all the items that only get utilized during the warm weather. Or, you could put up a structure that you can both store items in, and spend time inside, like a summer house, or garden office. Autumn and winter are beautiful seasons, with plenty of colour changes in the foliage and wildlife to liven up your garden. However, winter can seem a little bleak, especially before any crisp white snow arrives, and the all the branches look bare. Therefore, it’s worth looking into plants that will last you all year round, like evergreens, and climbing plants for your fences and walls, like ivy. Head to your nearest garden centre and talk to an expert about what you can add to the space that will still bring your garden a flash of green and maybe a red berry or two. You can add small trees with ease to your patio space; invest in some decorative pots, and you’ll ensure that your patio looks gorgeous no matter how cold it is outside. The evergreen shrubs and trees could also be the perfect place to string up some fairy lights. Investing in your garden will give you an extra room to your property, and you’ll have an area you want to enjoy more often, so it’s well worth the effort. Pots are a great addition to any garden. They add character and great colour, and allow you to plant smaller flowers that won’t be as open to harsher weather conditions during the winter months. Pots are a particular favourite of ours around the garden with several points acting as features around the garden. We’ve pots at our doors, near window insets and at corners of the house, each positioned to compliment what is around it. Head to your local garden centre and grab some pots to give your garden a new lease of life. Christmas presents a great opportunity to start bringing the outdoors into your home. While holly and berries can be the choice for many, why not consider creating some terrariums for your home and adding some vibrant winter hues to your home as a result. Check out our 8-step guide to making a terrarium and begin to bring the outdoors in this winter. Have you got anything in particular that you do to your garden over the winter months? We’d love to hear from you. Let us know your winter wonders by commenting below.